Stone lych gate and driveway. Plaque in church. 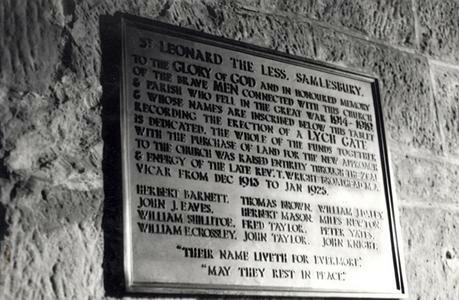 ST LEONARD THE LESS, SAMLESBURY / TO THE GLORY OF GOD AND IN HONOURED MEMORY / OF THE BRAVE MEN CONNECTED WITH THIS CHURCH / & PARISH WHO FELL IN THE GREAT WAR 1914-1919 / & WHOSE NAMES ARE INSCRIBED BELOW THIS TABLET / RECORDING THE ERECTION OF A LYCH GATE / IS DEDICATED. THE WHOLE OF THE FUNDS TOGETHER / WITH THE PURCHASE OF LANDS FOR THE NEW APPROACH / TO THE CHURCH WAS RAISED ENTIRELY THROUGH THE ZEAL / & ENERGY OF THE LATE REV.T.WRIGHT BROADHEAD M.A. / VICAR FROM DEC 1913 TO JAN 1925. / (NAMES) / "THEIR NAME LIVETH FOR EVERMORE" / "MAY THEY REST IN PEACE"
New guttering installed in 1977 and roofing flags repaired in 1990. Woodwork given a coat of preservative every year.